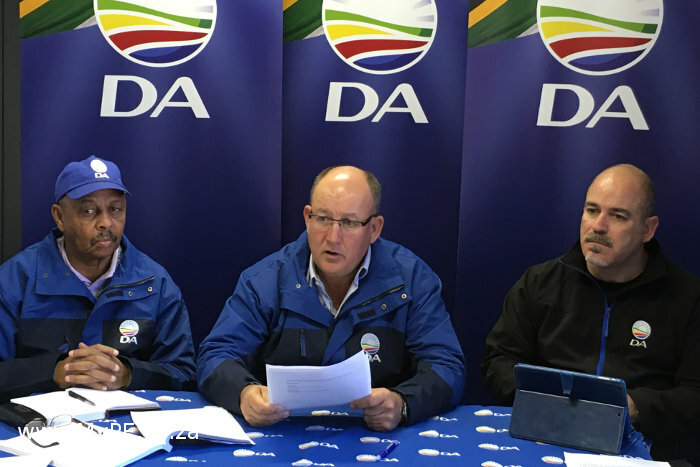 DA Infrastructure Spokesperson, Cllr Jonathan Lawack, DA Mayoral Candidate for Nelson Mandela Bay, Athol Trollip, and DA EDTA Spokesperson, Cllr Dean Biddulph, address the media on NMB’s unemployment crisis. Stats SA recently confirmed in the Quarterly Labour Survey that unemployment in Nelson Mandela Bay is 33.2%, second only to Ekurhuleni which currently stands at 34.4%. So severe is the unemployment crisis in the Bay that this ANC administration is now trying to sweep everything under the carpet by producing misleading reports that make nonsensical claims. It is both mathematically illogical and irrational to use unemployment totals when comparing cities of vastly different population sizes. For the 33.2% of Bay residents, and 47.6% of youth, who go without work on a daily basis, this deception by the ANC is an insult to their struggle. In municipalities governed by the DA, like the City of Cape Town and the Midvaal Local Municipality, unemployment is more than 10 percentage points lower than the national average. This is because the DA’s fair and effective job-creation policies directly combat unemployment by providing opportunities to all residents. A DA-led government in the Bay would immediately work to establish opportunity centres in crucial hubs, which would focus on working with business owners to streamline licensing, rates and utilities applications, land use requests and tax queries. Job zones in high-density residential areas will provide grouped facilities for informal traders to conduct business. These zones will not only supply utility services such as water, electricity and lighting, but will serve as mini-markets, where buyers can purchase everything they need in a single trip. Red-tape and a sluggish administration keep aspiring business owners very much out of business. The DA will work to ensure that all by-laws are current, enforced and suitable for the growth of small businesses. Those that are outdated or irrelevant will be repealed, as has already been done in the DA-led City of Cape Town. The EPWP rolled out by the DA-led City of Cape Town has been awarded by national government for its fairness and excellence, having created 116 000 job opportunities across the city. Due to its proven success, the city has now budgeted a further R229.2 million for the programme in 2016/17 financial year, which will undoubtedly create even more work in a city that is quickly rising to one of the best in the world. By launching municipal graduate programmes, outgoing university students will be able to gain valuable work experience in relevant municipal departments. This will build the Metro’s skills base, and expand the scope of expertise available to the market. In addition to this, a DA-led municipality will embark on a bursary programme aimed at identifying gifted and previously disadvantaged school learners with the intention of providing access to tertiary education. The DA can win Nelson Mandela Bay at this year’s local government election, to usher in a government focused on job creation and better service delivery.